Where do you get DIY ideas? These days there are so many bloggers we can turn to for inspiration – I don’t mean just for their outfit styling, I’m talking about people like Geneva from A Pair and A Spare and Erica Domesek from PS I made this who actually show their readers how to make things. 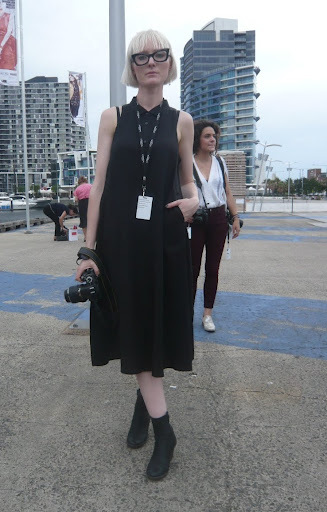 I love those ladies, but I also love getting ideas from the street, and there was definitely no shortage of street snap-worthy styles at LMFF! 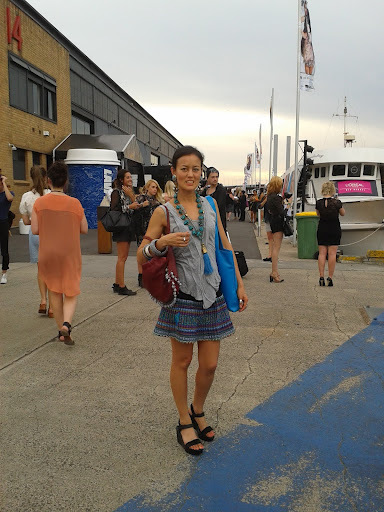 Lisa from Couturing.com is one very stylish, photogenic lady (hey, Australian Vogue thinks so, and you can’t argue with that!) – her choice of accessories is always inspiring. 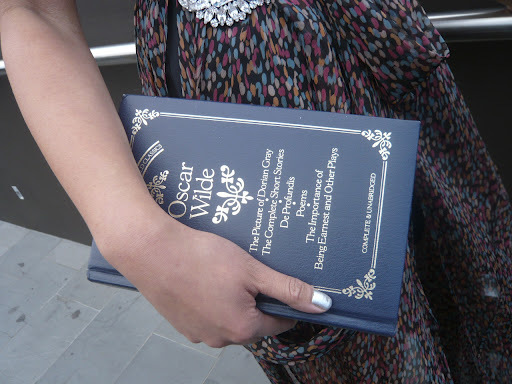 Here in the shot with me, she’s wearing Richard Nylon crocheted lace rabbit ears on a hairband and using a pencil case that looks like a Penguin book as a clutch (more on her book obsession later). This is a terrible pic (sorry Lisa!) so go to the Vogue link if you want to see the colours properly, but I wanted to include this shot as there is so much DIY potential. Beaded cape? Well the beads might be tricky but it would be easy(ish!) to make something similar with rows of fringing. Feathered skirt? I’m sure you could cut out “feathers” from felt or some other material to get this look – maybe cover up a mini skirt that you’re sick of instead of making a skirt from scratch? And if you want a small army of men on your head… you can always raid the toy box of your childhood or get some at a toy shop to glue on a headband. Not quite so over the top as Lisa, but with equal impact, this lady has gone for bold simplicity … everyone can use a simple jacket, especially in this great colour! Speaking of bold colours… I clashed some colours in this outfit which includes a Chinese jacket of my mum’s and a pink skirt that you can see more clearly here. 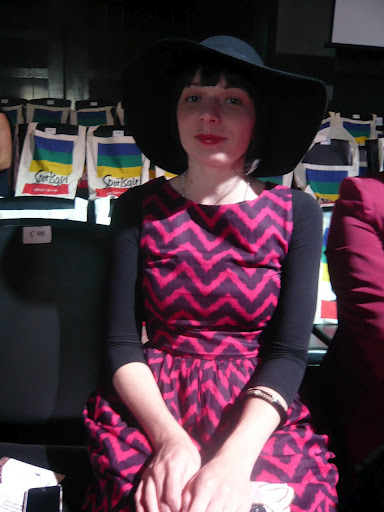 This is not the best shot as it was taken on my phone, but the jacket, which is usually fairly shapeless, kind of takes on a peplum effect when cinched at the waist (with a scarf from Laos) – maybe a handy trick to try? These ladies have all got fringing going on. I like the multicoloured fringing around the waist of the brown dress on the left (you could use scraps of material and stitch them to the waist of a boring dress or skirt, or the hem of a T-shirt), and the long fringe of the dress on the right would be simple to do, especially if you had lots of wool that you wanted to use up – again, a great way to jazz up a boring skirt. And here’s more fringing used a bit more conventionally, but the contrast of colours adds impact. Oh! 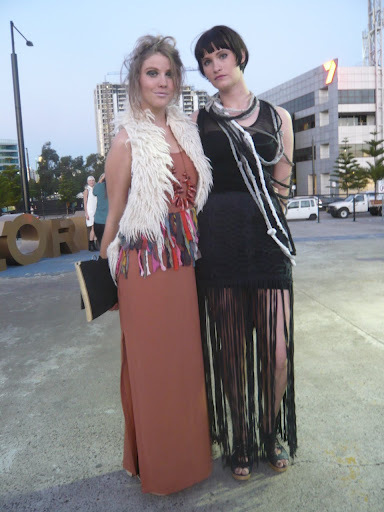 And I’m wearing a bit of fringe on my necklace here! 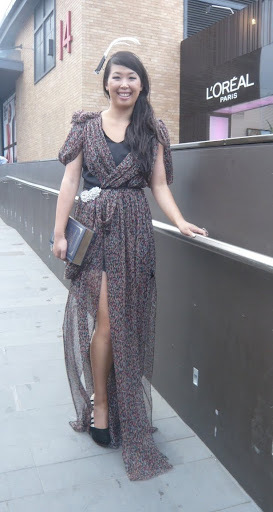 (Plus DIY shoes and a skirt I altered). Melbourne weather is so unpredictable. Tess from Peppermint has only just moved down here from Brisbane and I have no idea how she must be coping coming from a fairly consistently warm climate. Actually I do have a fairly good idea – layering. Tess is wearing a Gorman summer dress but has sensibly got a long-sleeved T-shirt underneath. 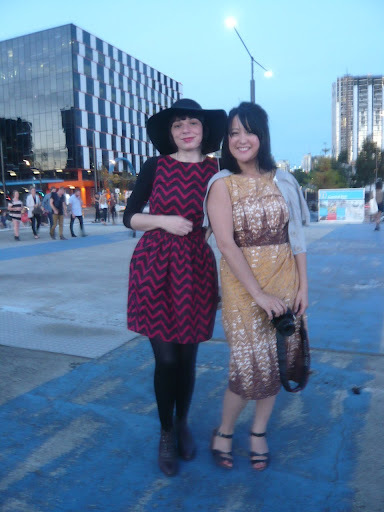 She’s with Cheryl from Busichic who is looking very stylish in a vintage dress and cardigan ensemble (the cardigan… yet another Melbourne must-have! I usually have one with me because you can never tell what the weather will do) while she has a chat with Tess. And here I am in a top that my alter-ego Miss Sew & Sew made for the current issue of Peppermint (issue 13), a skirt refashioned from a Peppermint project, and DIY necklace and earrings which I have not told you about because they are part of an upcoming project. Hint: they will be coming with me on my trip to Laos next week. This lady works for WGSN and was very busy snapping street looks, but I thought she deserved to be in front of the camera for a change. I know this kind of style would never work on me, but that doesn’t stop me admiring people who can rock it as well as she is doing (the camera makes the coolest accessory, don’t you think?). Perfect green pants! That is all. 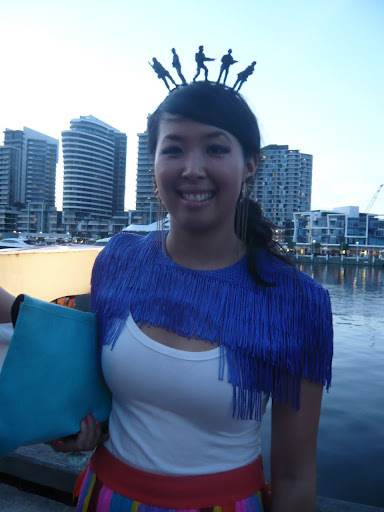 And here’s Lisa Teh again, this time in a Toni Maticevski dress as a tribute to the designer before his show – although she’s carrying a book in case the show gets boring. I told you she was obsessed with books! But wait! 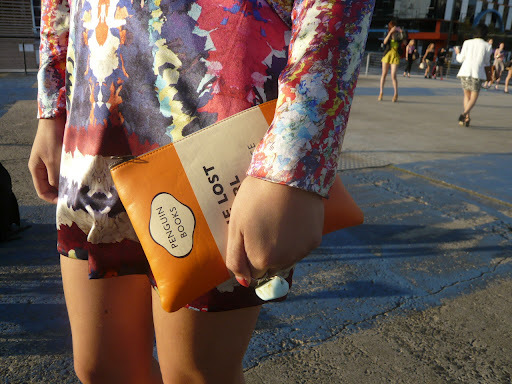 It’s not really a book! 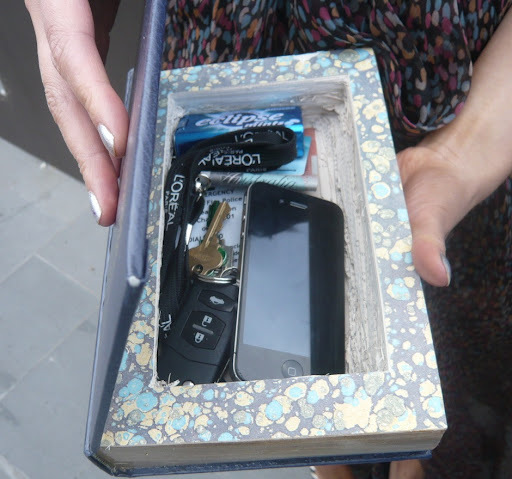 Lisa carved out the inside to make it a clutch where she carries all her fashion week essentials. I think this has to win the DIY competition, not that I was giving prizes. Lisa said she felt guilty carving up the book, but sacrifices must be made in the name of style. What have you seen on the streets lately that’s given you DIY ideas? Please share it with the rest of us!